In the fall of 2018 the City of Salzburg Road Administration decided to take the next step in the context of digitalization. 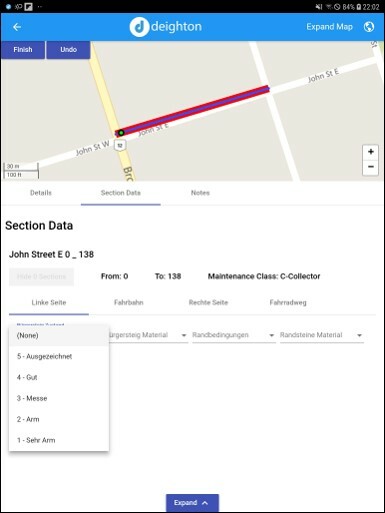 They required a mobile inspection app for visual pavement condition inspection, and a life cycle cost solution that would generate a multi-year construction program. Deighton was awarded the contract in March 2019. The City of Salzburg is one of the oldest cities in Austria, founded by the Romans with the name Iuvavum 15 B.C., where it became the capital of the province Noricum. The roman town was a central hub for Christianization in the region. The catholic church strongly influences the cultural development of the town from the architecture to the artw. The castle “Hohensalzburg” is one of the largest castles in the world and looms majestically over the town. The baroque cathedral as well as the palace and garden of Mirabell characterize the old town with a lot of narrow streets from the medieval times. Salzburg’s most famous son is Wolfgang Amadeus Mozart, who was born 1756 in the City of Salzburg and is one of the most famous composers in the world. He died 1791 in Vienna (his grave is still unknown). The City of Salzburg and the surrounding State of Salzburg came to the Austrian Empire after the Napoleon wars and are still a part of Austria. The City of Salzburg was also the home of the world famous Trapp family singers (Baron von Trapp) before they emmigrated 1938 and settled finally in Vermont.